It is well known that an energy efficient and reliable charging infrastructure is key success factor for deployment of eVehicles and new mobility schemes. We as Infineon are benchmark in all products of our broad portfolio: from power and control to sensor and security. We also guarantee expertise along the whole energy conversion chain: from power generation through transmission to consumption and automotive. Therefore we offer perfect solutions to optimize your systems with regards to power, efficiency and system size. Highest quality standards and unmatched manufacturing capabilities is what you’re looking for? 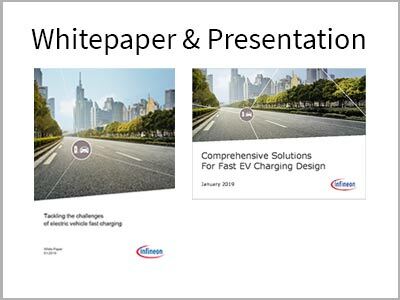 Our comprehensive portfolio is making us your most trusted partner for EV Charging designs. Learn more by choosing between white paper or extended slide-set. I agree Infineon providing me newsletters and further marketing information about Infineon* products, services & events by email and/or telephone and transmitting my data to its licensed distributors & partners exclusively for sales support purpose. I can withdraw my consent at any time. After your registration you will receive a confirmation email.